After several days (and sometimes weeks) of mania with Billy Ray's Bipolar we tend to sort of catch up. This picture was taken a few months ago but demonstrates what is happening in our house this morning. 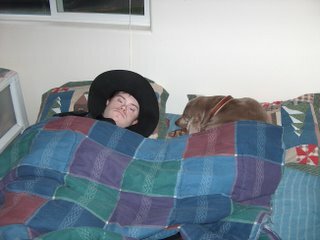 Billy Ray has woken up put his hat on, interacted with his service dog and then covered her up beside him. Some will think this is corny but I count this dog as a blessing. We haven't been able to take the bark out of her so she hasn't been able to be out in public as much as his last service dog. However, Penny Lane is a wonder in terms of detecting his moods and comforting him. I can safely go back to sleep when she is with him and catch up on some of my own sleep. If he is having breathing issues or wakes up she has proved herself credible to watch him (she comes to get me consistently). Hope you are having a good day in this busy Christmas season. I love the picture! He looks very peaceful. Glad that he finds great comfort in Penny Lane. They look like the best of friends!